In minutes, Darling heard the intercom system blast, “Evacuate the White House complex! All personnel are to evacuate the White House complex immediately.” But Darling could not leave his post as the airlift operations officer responsible for the logistical support for the President of the United States, who was traveling and would certainly need him in this crisis. 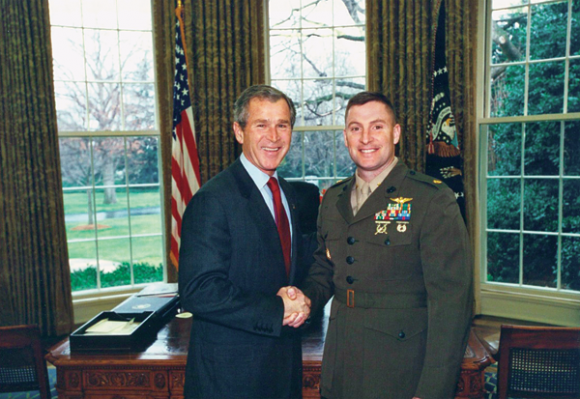 As a Marine Corps officer assigned to the White House Airlift Operations department, I was an integral part of the logistics arm of the White House Military Office (WHMO). Our mission was to support the safe and timely travel of the President, Vice President, first family and other designated VIPs who work in direct support of the White House by prepositioning helicopters, secure phones, Secret Service vehicles and other special equipment, utilizing the heavy-lift assets of the Department of Defense. Essentially, I was a glorified travel agent, and I loved every minute of it. On Sept. 11, 2001, my alarm went off at 5:20 a.m. and then again at 5:30 a.m. After forcing myself out of bed, I picked out a clean suit and got dressed. Military personnel assigned to the White House wear business attire to work rather than military uniforms, so that it is less like a military base and more like the home of the first family. On Wednesdays we were permitted to wear our military service uniforms. For Marines, that usually meant wearing the “Charlie” uniform—the green trousers and tan short-sleeved shirt. In the winter months, we switched to a long-sleeved tan shirt with a tie, called the Bravo uniform. The reason why we were permitted to wear our uniforms on Wednesday was a mystery, but it was a welcome opportunity to display ourselves as the fighting men and women of America’s Armed Forces, proud to serve both our country and our President. By 6 a.m., I was dressed and into my car, heading to Washington and the White House from my home in Stafford, Va., a suburb about 30 miles to the south. My first stop was the “slug line.” What other cities call “ride sharing” and “carpooling” is known in Washington, D.C./the Virginia suburbs as “slugging,” an informal, self-monitoring system that is free and not only moves thousands of commuters to work every day, but does so faster than the bus, Metro or train systems. In no time at all, I had the two passengers I needed to be able to drive in the High Occupancy Vehicle lanes. They were both female civilians who worked at the Pentagon. They hopped into my car, greeted me with a grateful “hello,” and we were off. As soon as I heard the click of their seat belts, I turned up the volume on my radio, pulled out of the commuter lot and joined the madness on Interstate 95 North. One of my passengers read her newspaper; the other stared out the window, probably pondering the day ahead. My day was supposed to be fairly straight-forward and ordinary. President George W. Bush was at the Emma E. Booker Elementary School in Sarasota, Fla., on a trip designed to spotlight education and reading, and all I had left to do was make sure the Air Mobility Command had everything in place to bring the presidential gear home the moment the President was safely aboard Air Force One on his way back to Washington that afternoon. I exited the highway near the Pentagon, which is a city unto itself. On any given morning, literally thousands of people head toward the building on foot from the enormous parking lots that surround it. They come by car, by subway or by public transportation, and they represent all walks of life and many different levels of responsibility. As a member of the military family, I always thought of them as unified by their mission: to defend America. I pulled over to let my passengers out, told them both to have a nice day and carefully made my way out of the parking lot. I crossed over the Memorial Bridge and then, a few blocks later, parked along the Ellipse, the much-photographed park between the Washington Monument and the White House. I walked to the Eisenhower Executive Office Building, otherwise known around town as the EEOB. It is the only building on the west side of the White House campus. I passed through security and made my way to the Airlift Operations Office on the fourth floor. We all gathered around and looked up at the large, white magnetic board on the back wall that displayed all the special-assignment air missions, or SAAMs, that were either being executed or planned. Each VIP was represented by a different colored magnet. Each magnet had a number and a destination. We didn’t know that at that very moment, four groups of terrorists were bearing down the East Coast to our financial capital and to our political capital. At approximately 8:46 a.m., American Airlines Flight 11 tore into the 96th floor of the North Tower of the World Trade Center. Like most Americans who are old enough to remember Sept. 11, 2001, I will carry with me the events of that day for the rest of my life—they are seared into my memory. I watched them unfold from deep within our government’s nerve center—inside the White House bunker. I saw and heard firsthand the reactions and responses of our nation’s leaders as the day passed in all of its minute-by-minute terror, with each event raw, unvarnished and unfiltered by the speculations of news anchors. The news of the first airplane slamming into the World Trade Center reached the Airlift Operations Office at about 8:50 a.m., and, like much of the country, we turned on CNN to get the details. We all stood in front of the television, speculating as to how and why an aircraft would have hit such a huge and prominent landmark on a crystal-clear morning. Had the pilot had a heart attack? Had some sort of massive aircraft technical failure occurred? At approximately 9:03 a.m., while staring at the TV, I commented to the others in the room as another airliner came into view. “OK, so what’s this moron doing?” No doubt trying to get a close-up view of the hole in the building, I thought. All of a sudden, to my horror and total disbelief, the airliner careened into the South Tower at what looked like full power, smashing with such fury that it looked as if the building wanted to fall over right then and there. When tragedy strikes on a national level and emergency supplies have to get to a disaster site immediately to save lives, the White House usually steps in on behalf of another government agency, such as FEMA, and orders the DOD to take action and coordinate the special-assignment air missions necessary to support them. As Stump was talking, the deafening noise of a low-flying, approaching airliner drowned out his voice as it overflew the EEOB and White House. We paused for a moment, staring at each other before running for the window. After having just watched the destruction in New York in real time, to say we were unnerved would be an understatement. A flyover like this was extremely unusual, because the airspace over the White House is classified as prohibited airspace, meaning no one is allowed to fly over it—ever. We now had the first inkling that this attack might not just be on New York, but on our nation’s capital as well. Within minutes, CNN announced more breaking news and switched its attention from the World Trade Towers in New York City to reports of a large explosion and significant fire at the Pentagon. What happened next was even more unbelievable. The building’s intercom suddenly came to life and ordered all personnel to evacuate the White House and the adjoining Eisenhower Executive Office Building. When in our history was the last time something like that ever happened? Maybe when Dolley Madison rushed from the White House, carrying out whatever she could as the British closed in on the city? Things were happening so fast that my mind raced to catch up and process this series of incredible events. , USAF, our director of Airlift Operations. We discussed the possibility that the President wouldn’t be coming back to Washington that day, and as the designated Airlift Operations officer responsible for his logistics that week, I felt I couldn’t evacuate and leave. If he wasn’t coming back to D.C., where would he go? What would he need? How would we get it to him? It was my job to figure that out, and I wasn’t willing to walk away from that responsibility, no matter what was happening outside. Col Irwin agreed, and with that, he ordered me to grab the Airlift Operations planning binder and to head for the White House basement to the President’s Emergency Operations Center to start coordinating military airlift assets to support the President’s movements. Grim-faced Secret Service agents were taking up positions in and around the White House to include the Ellipse to the south and Lafayette Park to the north. I paused for a split second at the surreal sight of the mass exodus before me and then quickly focused on getting to the White House basement. I entered the West Wing under the white awning, flashed my military credentials to the armed agents at the entrance and bounded down the stairs at nearly a full run. Arriving at the entrance, I picked up the phone, called the duty officer inside and requested access. The heavy steel door opened. As I entered, I immediately saw a very small contingent of WHMO personnel diligently answering phones and taking notes. No sooner had I announced to the duty officer that I was there to coordinate military airlift assets for the President than I saw one of the Vice President’s military aides. He was frantically answering phones and giving orders to other personnel. I put my Airlift Operations binder down in a corner of the room and immediately grabbed the nearest ringing phone, which turned out to be a direct, secure line between the Situation Room, located in the West Wing of the White House, and the PEOC. During the next 24 hours I stood side by side with the Vice President, national security advisor and other high-level White House staffers as America struggled to come to grips with the magnitude of the worst attack on U.S. soil since Pearl Harbor. Historic events such as the near shoot down of United Flight 93 as it approached a target in Washington, D.C., at more than 500 mph; the scramble to kill an unidentified bogey aircraft approaching the White House from the west only to find out at the very last moment that it was a medical evacuation helicopter on the wrong frequency heading to save lives at the Pentagon; the credible source and the threat to President Bush onboard Air Force One; moving our strategic nuclear forces to Defense Condition 3 (DEFCON) and the concerned call from Russian President Vladimir Putin; and of course, the horrific moments of watching the Twin Towers collapse, the devastation at the Pentagon, and the emotional toll it all had on the President as he was informed that the death toll could be as high as 40,000 Americans; as well as the moment al-Qaida was implicated in the attack and how President Bush informed his Cabinet to prepare America for war; and other untold events unfolded while we were inside the White House bunker. What I witnessed during those 24 hours was unprecedented crisis leadership from our nation’s top officials as they recognized the scale, coordination and devastation of the attacks against us. I was struck by their decisiveness to take lives of those unfortunate enough to be under the control of suicidal terrorists, in order to save scores of innocent lives on the ground. They weren’t just politicians; they were brave Americans who, when faced with the worst reality imaginable, rose to the challenge of our time to protect our America. I was proud of their courage and I was proud to stand among them. The next day I returned home to my family and hugged my wife. I knew that our war against terrorism and radical extremism would be a long fight. I was emotional over the thought that my service to our country wouldn’t be enough to guarantee endless freedom for my children, but that someday they too would most likely have to join ranks to continue to protect and defend the country we love and our American way of life. Since Sept. 11, 2001, I’ve retired from active-duty service, but continue to watch with pride as America’s servicemen and women wearing the uniforms of the Army, Navy, Air Force, Marine Corps and Coast Guard have stepped forward to be counted as warriors in democracy’s defense. I drive by the Pentagon often, and I never forget to thank God for what it stands for: the power and might of the greatest nation on earth. The ground at American Flight 77’s site of impact is consecrated soil now. The memorial erected there is an elegant testament to the sacrifice of the 184 men and women on board the plane and in the Pentagon. As I pass by its outer walls, I remember them, and I silently promise them I will never forget their sacrifice. I think of the heroes of United Airlines Flight 93, who would not let the terrorists win and who may have saved unknown numbers of lives in the nation’s capital with their selfless, spontaneous and collaborative acts of bravery. I hope I would have that much courage if faced with the same decision. And I think of all our fellow countrymen and citizens of foreign nations who perished in the World Trade Center and the first responders—the firefighters, police, New York City Transit workers and ordinary citizens—who braved a fiery hell itself to save others after American Airlines Flight 11 and United Flight 175 were plunged into the North and South towers. As a Marine, I am proud to have played even a small role in the events of that transformational September day. And I will never forget. 24 Hours Inside the Presiden’t Bunker, 9/11/01: The White House is now available. Find out what really happened at the highest levels of our government during the worst attack on America since Pearl Harbor.